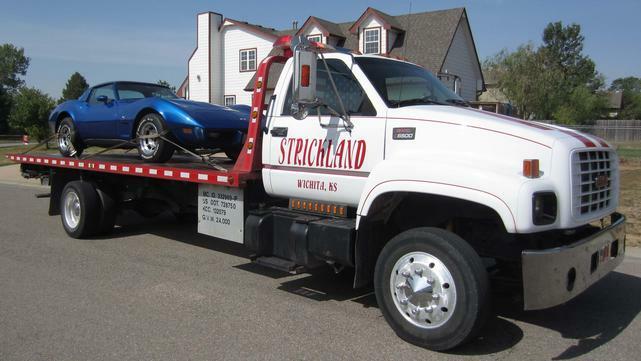 Strickland Towing of Wichita, Kansas is more than your ordinary towing company. We pride ourselves on providing quality service and customer satisfaction. If you are stranded on the side of the road, we will help you find the right place to take your vehicle. We want to get you to your repair shop as safely and quickly as possible. To accommodate multiple passengers, we have extended cab and 4-door trucks available upon special request as well as cab services. If you are involved in an accident, we are more than a towing company, we are your consultants who can help you make the right decisions based on your personal needs. We provide Towing and Accident Recovery for ALL sizes of vehicles from cars and motorcycles to tractor-trailers. We also provide roadside and curbside services such as tire changes, jump starts, vehicle unlocks, battery replacements, and other minor mechanical repairs on-site. 100% of our drivers have completed formal training classes and our company has bi-weekly safety meetings and a drug free work environment. "MAKE THE BEST CHOICE, CALL STRICKLAND TOWING, WE ARE MORE THAN JUST A TOW SERVICE"
Coming Soon from Mud Truck Television Productions - Crashed! The story of a family owned towing and road service company in Kansas. Amazing accident recoveries, customers' perspectives, colorful personalities from employees, it's all here in one show!!! !